Periodontology – treatment of gingivitis, bleeding gums, receding gums, falling teeth in Queseda, Rojales, Torrevieja near Alicante in Spain. What is Periodontitis / Periodontosis? Periodontitis or Periodontosis ("Periodontal" derives from two Greek words meaning "around the tooth") is an inflammation of the periodontium caused by bacteria and the existence of tartar or dental calculus (hardened plaque), leading to receding gums and subsequently reduction of the jaw bone. The consequences are loosening and finally falling teeth. Many teenagers and adults are affected by periodontitis without being aware of it. Gingivitis (gum inflammation), bleeding gums and receding gums are the first signs of periodontitis and are often not identified and treated early enough since gum problems initially do not cause pain (and people tend to think: “As long as it doesn’t hurt, no need to act” – a wrong conclusion). Periodontal disease – how does it develop? Bleeding gums are normally the very first sign for periodontitis. The gum turns dark red (instead of the pale pink in healthy condition). Food particles which accumulate in the gingival pockets are forming, together with oral bacteria, bio-film called plaque. This plaque subsequently becomes tartar (dental calculus), the hardened form of plaque. The existence of tartar (dental calculus) can already lead to the first signs of gingivitis (inflammation of the gum). If not treated early enough, the gingival pockets (the “pocket” between tooth and gum) will get deeper with time. 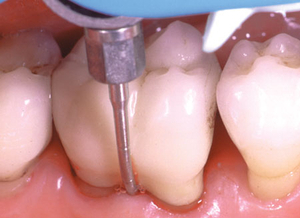 When the pockets reach a depth of 3.5 mm, dentists diagnose periodontitis. However, this condition only marks the beginning. Untreated, the tartar (dental calculus) can spread deeper down the teeth leading to receding gums and a receding jaw bone. The teeth begin to loosen. Between the front teeth a so-called “black triangle gap” can appear as there is simply no gum left to cover the tooth neck. Still not treated, the loss of the teeth is most inevitable. However, long before it comes to tooth loss, disconcerting side-effects appear: the tooth neck gets very sensitive to hot and/or cold food and drinks and it will be impossible to chew harder foods (such as apples, nuts, bread, meat or raw vegetables) due to loosened teeth. How can you raise your chances to keep healthy teeth until old age? With daily dental care at home as well as regular professional dental hygiene ! How can Periodontitis / Periodontosis be treated? Gingivitis (gum inflammation) of the surface tissue can be treated with specific oral hygiene measures. This includes correct cleaning of your teeth twice a day (best is the so-called “modified bass technique”), the cleaning of the interdentium with dental floss (or, if indicated with an inter-dental brush or a mouth shower) and regular professional dental hygiene (at least twice a year, in periodontitis cases up to four times a year). In any case it is important to remove the plaque since plaque when it is getting harder is turning into tartar (dental calculus), offering bacteria a convenient environment to thrive. Old fillings and dental prostheses should be renewed – in case they are not fitting tight anymore, they offer an ideal space for bacteria to multiply. Sometimes the inflammation of the gum (gingivitis) and jaw bone has already reached a state, in which professional dental cleaning is not sufficient anymore to reverse the process. In this case, the “concrements” in the gum pockets need to be removed. (“Concrement” is a tartar or dental calculus, which is even harder and darker and adheres to the dental root.) This requires special hand tools or ultra-sound devices (such as the Vector®) which can reach right down to the base of the pockets in order to remove the hardened tartar. In our dental practice we use a device called „Vector Pro®“ (by the company Dürr Dental). This device allows a gentle periodontitis treatment: Cleaning and smoothing of the dental root surface and the removal of inflamed tissue from the gum pockets, as well as killing of bacteria by ultrasound, without harming gum or gum pockets. Contrary to other conventional ultrasound tools, the Vector® vibrates vertically instead of sideways. This allows deep cleaning with a polishing liquid, scrubbing the root surface very gently, without affecting the teeth mechanically. For patients, this method is a lot more comfortable than it is with conventional hand tools. Also, it avoids the risk of tooth roots becoming oversensitive – this is often the case when tartar (dental calculus) is removed by scratching it away manually. The periodontitis treatment is carried out with a special device (Vector Pro by the company Dürr) which removes bacteria and concrements from gum pockets. This allows us to choose the right antibiotics for your treatment. 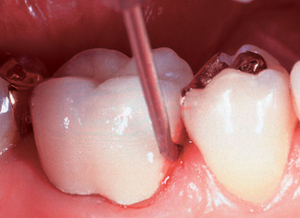 However, no parodontitis treatment is like another and will be determined after a thorough individual examination. Gingivitis (gum inflammation), bleeding gums, receding gums – the consequences of periodontitis – are next to caries the most widespread dentall diseases which affects millions of people world-wide. Untreated, the disease nearly always leads to tooth loss. Moreover, scientific studies show a definite connection between periodontitis and the risk of heart attacks as well as strokes. Also, the risk of miscarriages and premature delivery rises significantly. In people with a weakened immune system, periodontitis can promote pneumonia and other respiratory diseases. 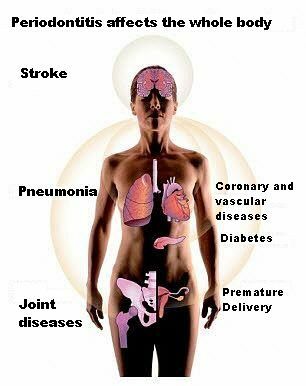 Untreated, Periodontitis / Periodontosis not only leads to tooth loss but also increases the risk for heart attacks and strokes, can cause premature delivery and miscarriages and weakens the immune system. Correct and consequent dental hygiene as well as regular professional dental hygiene can prevent gingivitis (gum inflammation), bleeding gums, receding gums and falling teeth. Do not wait until it hurts! It might already be too late then! Call us on: (+34) 96 671 72 36 or send us an email.